Mike Overton took this his time in uniform quite seriously. Mike Overton was all business. 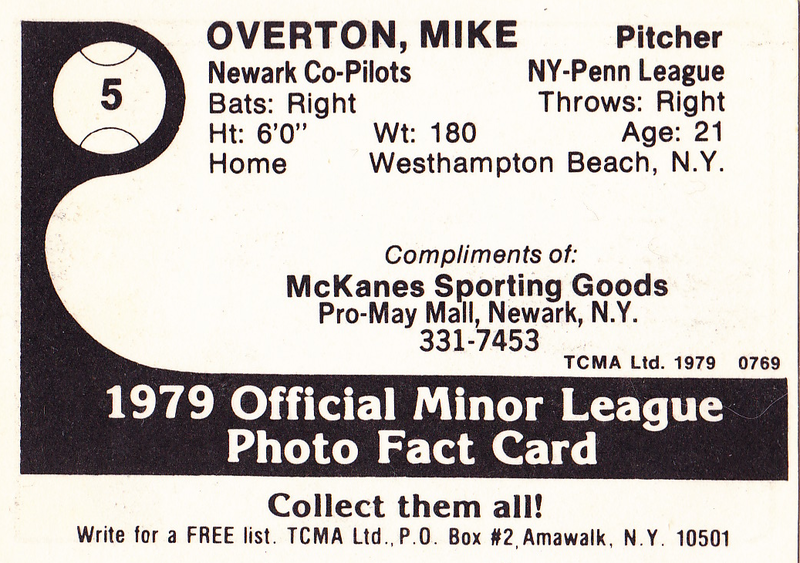 After this photo shoot, I bet Mike Overton went right over to the Newark Chamber of Commerce and created some local jobs. Some TCMA minor league team sets include sponsorships, which the team likely arranged in advance and included with their print order. McKanes Sporting Goods seems to be gone for good, though I found a few mentions of Newark's Pro-May Mall, including this 1984 newspaper article about a videotape service hosted in the same mall. And speaking of mustaches and videos, wish I could grow one half as good as Mike's. UPDATE: Sadly, Mike passed away in 2011. Thanks for the visits and comments from his family and teammates. Here's the full TCMA set checklist, so others can also find his card. Value: This #5 cost $2 at MinorLeagueSingles.com and team sets run as little as $10 on eBay. 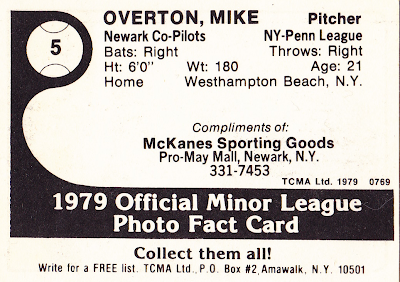 1979 was Overton's only year in pro ball. He apparently passed away last year. No kidding! He must've signed with the squad when they went independent. Sorry to hear he's gone. Hi, not sure if you know where Newark is. It's about 40 minutes east of Rochester, New York. Small town of about 10,000 people. 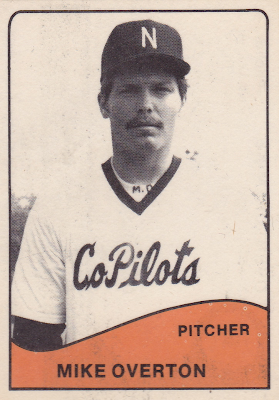 Robin Yount played part of his rookie season for the CoPilots in'73. Very cool to finally see my Fathers Card. He had a bunch before but handed them to family and have never seen it till now, My Father passed away July 24th 2011 after a year long fight against cancer. Bryant or Pattie I also might have a card of Mikes from that summer. Let me know if youd like it Id be happy to send it.